Looking forward to all the great shows ahead! Armon will be performing at TEDER (Jaffa Road 9)! Doors open at 21:00, admission free. Echo at the Barby (52 Kibbutz Galuyot)! Doors open at 20:30, show an hour+ later. Tickets are 65 NIS early bird/75 NIS – order online from the Barby via this link. Ron & The Red Beans at Bar Giyora (Ibn Gvirol 30)! Doors open at 20:15, show at 21:00. Great swing music & tap! Guitar, vocals & tap – Ron Freund; Tap – Josette Wiggan; Saxophone – Roey Bar Yehuda; Double Bass – Ziv Grinberg. Tickets are 60 NIS in advance/70 NIS at the door – order online via this link. Boom Boom Boys at the Container (Jaffa Port)! Music 50s & 60s style – so fun to dance to their rock ‘n’ roll sound! Doors open at 21:30, show typically starts after 22:00, admission free. BENJA (Tatran) featuring Dan Mayo and Yaron Ouzana at Kuli Alma (Mikveh Israel 10)! Doors open at 21:00, show at 22:30, admission free. Feldy (Yael Feldinger – Phototaxis) at Levontin 7 with special guest Daniel Sapir! Yael describes these songs as influenced by flamenco, blues, folk, and artists like Bill Withers and Billie Holiday. I heard these songs first at Yearot Menashe 2018 – so intimate, powerful. Performing with Yael are Liron Dan on guitar and Shimon Greenstein on percussion. Doors open at 22:30, admission 30 NIS. Tickets can be ordered online via this link. Yossi Fine & Ben Aylon at Herzl 16! Music from the Blue Desert makes an amazing dance party! Yossi Fine – guitar & vocals, Ben Aylon – drums & African drums, Lior Romano – keyboards & bass, Ella Greenbaum – dance. Doors open at 21:00, show begins late, admission free. Dirty Fly at Kuli Alma (Mikveh Israel 10)! Doors open at 21:00, show at 22:30, admission free. The fabulous Funk’N’stein are celebrating their 20th anniversary at the Abraham Hostel (Levontin 21) with special guests Geva Alon, Yael Deckelbaum and Shaham Ohana! Doors open at 21:00, show at 22:00. Tickets are 70 in advance/90 at the door, and may be ordered online via this link. 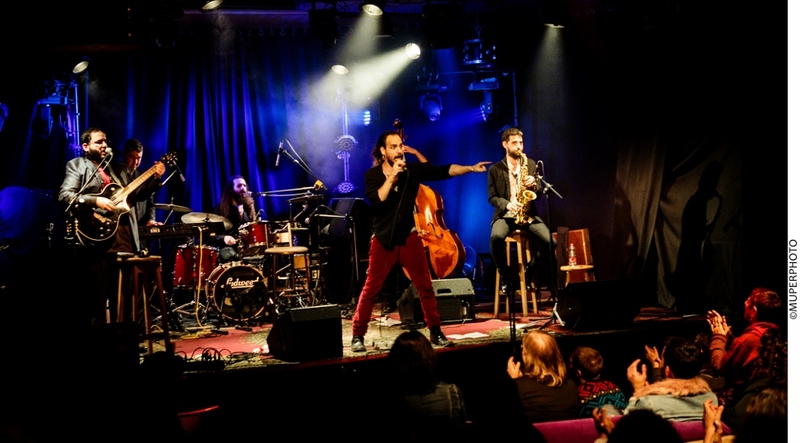 Tel Aviv Swing City at The Zone (Harechev 13)! A celebration of Dixieland, Swing & New Orleans with Eli and The Chocolate Factory with Miss Mikey May performing music of the 20s, Danny Rosenfeld Octet with music of the 40s & 50s, and the New Orleans Function Band. Doors open at 20:00, show starts at 21:00. Tickets are 90 NIS in advance/110 NIS at the door and may be ordered online via this link. MarshDondurma at The Zone (Harechev 13)! This 16-member band with a unique sound is celebrating their 5th album & 1st international launch on vinyl. Doors open at 21:00, show usually around 22:00. Tickets are 50 NIS in advance/60 NIS at the door, and may be ordered online via this link. Blues & Booz featuring Twin Tree Grove at Pasaz (Allenby 94)! Twin Tree Grove – led by Ofer Amichai, their sound is pure and exuberant as whiskey at sunset, with all the heat of the moment, and the feeling that lingers. The show will be followed by the traditional jam. Doors open at 22:00. Alaska Snack Time at Kuli Alma (Mikveh Israel 21)! Mixing genres freely – Live Electronics, Hip Hop, Psychedlia, African Rhythms, Pop/Rock and Jazz. Doors open at 21:00, show around 22:30, admission free. Uzi Navon Trio in an intimate performance at Herzl 16! The versatile singer-songwriter is a consummate entertainer in retro style – pure pleasure! Doors open at 21:00, show begins late, admission free. Seasonal Beast at Pasáž (Allenby 94)! The sound is dark and delicious, with lush texture and a sense of volcanic force pulsating beneath the dreamy surface. Performing: Yula Beeri – vocals; Yuval Semo – keyboards & vocals; Isaac Henry Gardner – drums; Jonathan Levy – bass; Alon Albagli – guitar. Doors open at 21:30, tickets are 40 NIS in advance/60 NIS at the door – order online via this link. Blind Orchestra at Beit HaYotzer (Hangar 22 Port of Tel Aviv)! Fantastic music, action, suspense, and the kind of party you wish would never end – Blind Orchestra is all that and more (read the full review here ). Emerging from the perpetually creative brain of Dov ‘Balu’ Rosen (founding member of The Angelcy & Lo Dubim), the concept is very intriguing: in each performance a different ensemble of musicians performs blindfolded, in sets of improvised music, conducted by touch, with a different conductor for each set. This sessions improv gang: Marianne Tur – Violin, Dor Levin – Drums, Synths, Dvir Golan – Saxophones, Nitai Marcos – Bass, Eyal Tafesh – guitar, Freshon Ski – Vocals & Beatbox; ,Adi Gershon – Vocals; Dov Balu – Drums. Doors open at 21:30, show starts at 22:00. Tickets are 40 NIS and may be ordered via this link. Tigris at TEDER (Jaffa Road 9)! Merging African percussion instruments, guitar, bass, keyboards, electronica and an otherworldly vibe, Tigris sends a visceral message that penetrates deep. The first time I heard their new EP Lightning, the music felt like subversive invasion that takes over your body, making it move to the rhythm of the driving dark beat of an alien heart. Performing: Ilan Smilan – guitar; Amir Sadot – bass; Roei Hermon – keys; Itamar Katzir – African drums; Oded Aloni – cajon & percussion. Doors open at 19:00, show at around 20:30, admission free. Blues & Booz hosts Blues for Mama Nina Simone’s B-day featuring Hagar Levy at Pasaz (Allenby 94)! Hagar Levy is a singer-songwriter whose voice resonates with beauty and power. When she sings, she’s all in, and she has the courage to put it out there, to be open. Pain, joy, anger, hope, dreams – you can hear it all in her voice; her vulnerability and her strength. Hagar Levy approaches her tribute to Nina Simone in the same way, with sincerity, intelligence, and an open heart. Nina Simone (1933 – 2003) is an almost mythological figure – pianist, vocalist, composer, activist. Everything she said, wrote, or performed is marked by her distinctive style. Hagar does not attempt to reproduce that style, but rather enters into Simone’s oeuvre, singing the songs of Nina Simone, as Hagar Levy. And it all works beautifully. Doors open at 22:00. Following the show there will be the traditional Blues & Booz jam. The Turbans at Kuli Alma (Mikveh Israel 10)! Jerusalem based garage rock band that will get into your head & have you dancing! Doors open at 21:00, show at 22:30, admission free. Luna Abu Nassar at HaTeivah (Sderot Yerushalayim 19, Jaffa) with songs from her new album A Night in the Forest (recorded live!) in an intimate, 360° performance – no stage, the audience surrounds the musicians. Performing: Luna Abu Nassar – vocals & classical guitar; Adi Gigi – double bass; Stav Lipitz – drums. Doors open at 21:00, tickets are 70 NIS and may be ordered via this link. Twin Tree Grove at The Container (Jaffa Port)! Folk-rock originals – songs of the back roads, hard traveling and lost love, sincere but no longer innocent, with a restless energy and timeless quality, led by Ofer Amichai, their sound is pure and exuberant as whiskey at sunset, with all the heat of the moment, and the feeling that lingers. Doors open at 21:00, show starts around 21:30 – 22:00, admission free.